Although the first vineyard in our region, Sanford and Benedict, was planted in 1971, it was not until 1997 that Wes Hagen and his group of merry marauders could be seen tromping through the hills of our valley taking soil samples, studying elevation levels and compiling data on degree days. Spearheaded by Richard Sanford, Bryan Babcock, Rick Longoria and other local SRH pioneers, the Alliance spent time studying maps, discussing boundaries and gathering data to submit an AVA Petition in late 1997 with AVA status granted in 2001. With a total area of 30,720 acres, the Sta. Rita Hills AVA is home to over 59 vineyards, totaling 2,700 hundred acres planted to Pinot Noir, Chardonnay and 18 other cool climate wine grape varieties. The miracle of the region’s microclimate began about 20 million years ago during the Miocene Epoch, as marine sediment was deposited deep under the Pacific Ocean. Due to tectonic plate movements, mountains rose out of the ocean in a north-south orientation. Over a timespan of twelve million years, the mountains broke from the plate and turned clockwise, creating the most clearly delineated transverse range, from Alaska to Chile, on the Pacific Coast. The combination of a purely East/West maritime throat, poor marine-based soils, elevated calcium in the soil and the Pacific’s cooling influence through fog, wind and moderating summer heat combine to form one of the world’s best cool-climate viticulture areas for Pinot Noir and Chardonnay. The flavors and complexity of Sta. Rita Hills wines come from a combination of east-west coastal valleys, cool weather, fog, wind and soils that limit vine vigor and crop yield intensifying the flavors of our wines. Natural acidity balanced with firm structure is a common thread in the wines throughout the region making them easy to pair with a variety of foods. 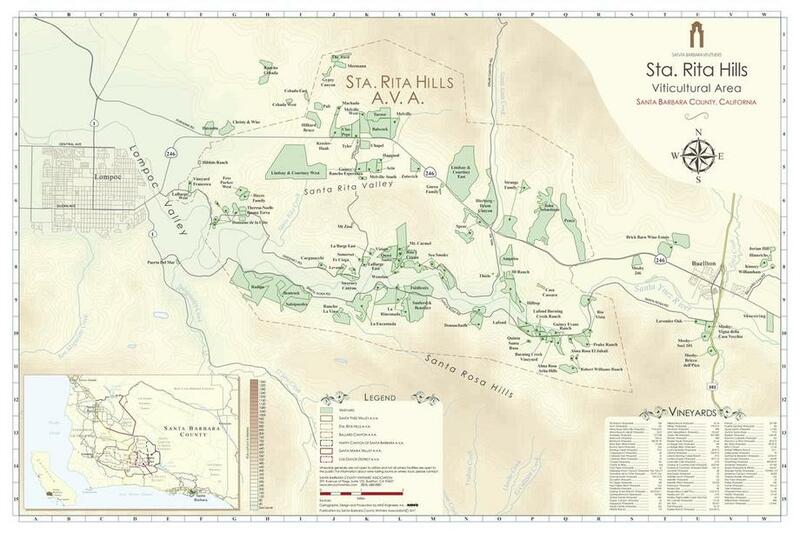 Although the appellation contains a few of the more revered older Pinot Noir vineyards in the state, many of our Sta. Rita Hills AVA vineyards are distinct from those of older winegrowing regions. Because most of our vineyards have been planted in the last two decades, we have been able to use modern trellising, newly available ‘cultivars’ or ‘clones’ of Pinot Noir and Chardonnay, and have been able to implement cultural practices that have been championed in the recent body of viticulture research and literature. While our vineyards and wines have received critical acclaim in a short period of time, we continue to fine tune our vineyard practices and look for ways to improve wine quality as our vines mature. There are approximately 3,000 acres of Pinot Noir and 500 acres of Chardonnay planted in our AVA. Additionally, 140 acres of Sta. Rita Hills vineyards are planted to Syrah, Sauvignon Blanc, Viognier and other wine grape varieties. The boundaries of the Sta. Rita Hills appellation were chosen carefully to include all locales between the Santa Rosa Hills and the Purisima Hills that matched our criteria for hillside Pinot Noir and Chardonnay viticulture. One of the smaller AVAs in California, the eastern edge of Sta. Rita Hills is about four miles west of Highway 101 in Buellton and continues to the western boundary, about two miles east of Highway 1 in Lompoc. The southern boundary is the north side of the Santa Rosa Hills, with the northern boundary the south side of the Purisima Hills. Those areas outside of the appellation boundaries (West of the AVA boundary and South of Lompoc into Salsipuedes) were believed to be distinct from the geographical and climatic features that define the Sta. Rita Hills AVA.